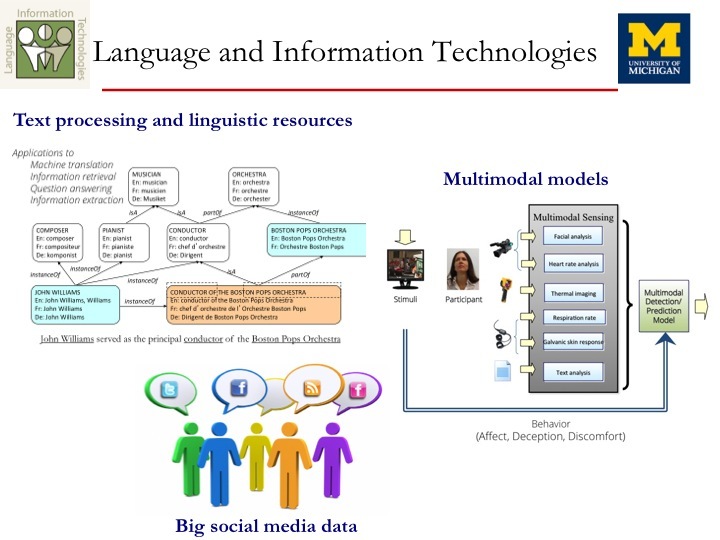 The Language and Information Technologies (LIT) lab, directed by Rada Mihalcea, conducts research in natural language processing, information retrieval, and applied machine learning. The group specifically focuses on projects concerned with text semantics (word/text similarity, large semantic networks), behavior analysis (multilingual opinion analysis, multimodal models for deception detection, emotion recognition, alertness detection, stress/anxiety detection, analysis of counseling speech), big data for cross-cultural analysis (geotagging, understanding cross-cultural differences and worldview), educational applications (pedagogical search engines, automatic short answer grading, conversational technologies for student advising). Several of the projects in the LIT lab are interdisciplinary, acknowledging the fact that language can be used to deepen our understanding in many different fields, such as psychology, sociology, history, and others. Some of the ongoing projects in the lab are collaborations with psychologists and sociologists, and target a rich modeling of human behavior through language analysis, seeking answers to questions such as “what are the core values of a culture?” and “are there differences in how different groups of people perceive the surrounding world?” The lab is also actively working on multimodal projects to track and understand human behavior, where language analysis is complemented with other channels such as facial expressions, gestures, and physiological signals. Of interest, Prof. Mihalcea was quoted in a story about sexism and today’s virtual assistants such as Amazon’s Alexa, Apple’s Siri, and Microsoft’s Cortana; Refinery29. 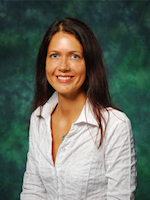 The LIT lab conducts research that brings together techniques for natural language understanding, multimodal processing, and social media analysis.